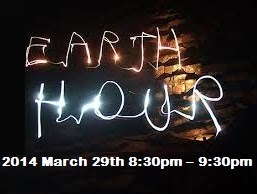 One of the best measures in the world in terms of saving energy is the “Earth Hour”. This event happens every year and participated by 150 countries around the world. This is once again a time when the countries unite to solve one particular issue that is making a huge impact in the lives of people around the world. If you are a Filipino, you are invited to be part of this event by switching off your appliances and other gadgets run by electricity at 8:30 – 9:30 tonight March 29, 2014. This is an hour of saving the world’s power supply and eventually conserving energy for future use. If you are wondering where in the country Earth Hour will be observed, care to check Eastwood Mall Open Park and SM Mall of Asia’s By the Bay area. These are just some of them from the many establishments set to support the said event. Aside from these, even the Makati City government and all its local units are also supporting the event. It only shows that the government is looking forward to the big savings of the country in terms of energy. We know for a fact that there are problems and issues on our power supply and this is the best time to do something about it. The WWF is also encouraging the Filipinos to do something for the environment. Any simple act of kindness will do. In fact, it measured the amount of emitted carbon dioxide annually by the Filipinos of about 0.9 metric tons. Earth Hour CEO Andy Ridley even stressed the fact that it is not just a matter of switching off the electricity but a measure wherein the citizens of this world are showing concerns to the planet and eventually saving it. Be a part of creating a huge change in the globe. Support Earth Hour.